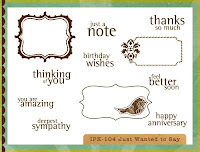 The card featured today is based on a sketch from the Just Christmas and Birthday cards challenge blog. I used Joanne’s adorable “buttony bow” idea…do ya love those bows or what!?! :) Her fab tutorial on how to make a “buttony bow” of your own can be found here. Thanks so much for stopping by! Now it's time to hop on over to the blog of the awesome "buttony bow" tutorial creator, Joanne as she is the next Bella lovah on the hop. Edited: Sorry, but this pre-order offer is no longer available. Thank you for interest. I will not be selling the individual stamp kits until I have them in stock (which could be a few weeks from what I understand). Be sure to follow me for blog updates as I will announce it here as soon as I have the kits in my hot little hands and ready to ship. Have a great day! FREE SHIPPING(US only) plus A FREE GIFT (retail value $6.50) especially for YOU! 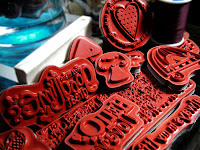 You receive 8 cling mounted red rubber stamp kits (retail value $168!!! 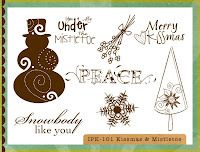 ), a FREE gift of 6 Yummy 12x12 papers, and FREE shipping(US)...all for $99. 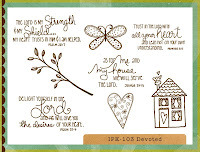 Be sure to order soon as this very limited time offer will be removed from my blog on Sunday evening. 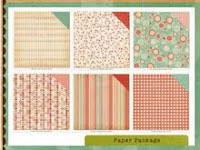 Here is a picture of the 6 pieces of FREE paper you will receive with your order...yum! Hi there! 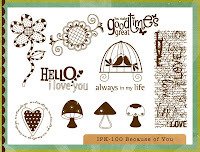 Welcome to the LuLu Blog Hop sponsored by Stamping Bella! If you've just happened upon my blog, you can CLICK HERE to start from the beginning at Bloggabella. How about a prize? In addition to the fabulous eye candy, we have decided to hide a prize somewhere along the hop! 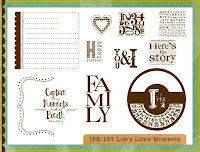 One pre-selected blogger will draw a random winner from the comments on her post, and the winner will receive a $25 Gift Voucher to Stamping Bella!!! The fun part is...we're not telling you who it is! So as you hop, make sure you leave comments on every post so you have a chance to win!! We will announce the winner on Monday in the Splitcoast forum. MWAH!Thanks so much for stopping by! 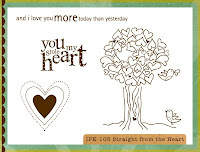 Now it's time to hop on over to Karen's blog, http://www.paperplayhouse.blogspot.com/. Hello friends! 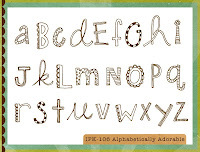 I cannot seem to resist adorable non-scary monster stamps like this one from Daisy Bucket. Here is the card mentioned in my previous post that is headed in my cousin’s direction as we speak. 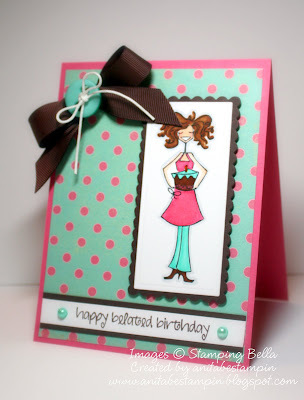 I love, love, love bright colors so this was an especially fun card for me to make. All of the red paper was hand cut in an effort to make the jagged, irregular edges mimic the monster’s teeth. I attempted to make it look like this monster had taken a little nibble right out of the corner of the sentiment layer. Please make a note that I have broken my own personal record by using 3…count ‘em 3…different patterned papers on one card…lol. :) I hope you like what you’ve seen today. Have a bright, non-scary Friday! Happy Sunday to all! I had a lot of fun participating in the Anya fashion show this weekend that I learned about on The Greeting Farm blog. 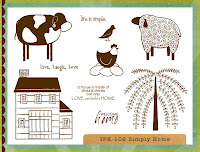 The challenge was to use any Anya stamp from The Greeting Farm and dress or "glam" her up. As soon as I saw the hat on Anya, I was reminded of a hat that Renee Zellweger wore in the movie Leatherheads. While this movie wasn't my favorite, I'm thankful for the inspiration nonetheless. I thought the hat would look great paired with a little sequined flapper dress. The dress was created by layering tiny strips of ribbon that were attached to very thin strips of Sticky Strip adhesive. Tons of Stickles glitter glue was added to the ribbon stips once the dress was assembled. Not only is Anya's dress full of *bling*, but even more Stickles were used to embellish the hat and glittered brads were used as flower centers on the sentiment anchor...she just sparkles in real life!